You can’t get just 2….it’s a rule! 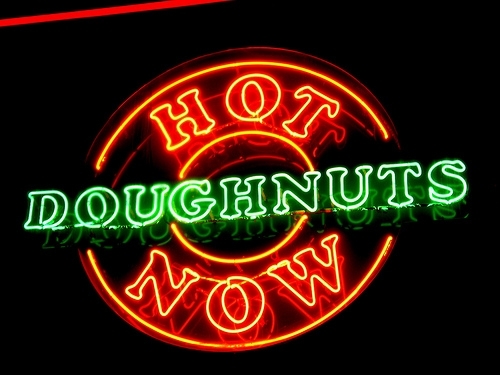 The Hot Doughnuts NOW sign flashed like a beacon calling me home last night after the movies. I HAD to pull into the newly opened, shiny, make-them-right-here Krispy Kreme store…..but I stayed strong and decided to go through the drive-thru…no need adding to my paralyzing decision-making by going INSIDE! I only wanted 2 doughnuts, one for me and one for Tater. But I had no cash….Who carries Cash? And I didn’t want to use my Debit card for $1.98…who does that? So I’ll just get 6 donuts. That’ll work. Besides, $5.58 is MUCH better than $1.98 on a Debit Card, because WHO would use a Debit Card for $1.98?? And then that sweet, little angelic girl at the speaker said magic words that put me over the flippin edge…. Well, THAT’S it ~ A sweet little southern girl telling me for ONLY $2 MORE I can get SIX MORE donuts? Well, sign me up and call me Happy! SURE, I’ll take the dozen. AND THEY’RE HOT!! Have sweet Flippin Mercy ~ I surely do hear the Angels singing now!!! And THAT’S why I have 9 donuts in my Kitchen Right Now (I may have had more than my one….)! Previous Just one of the cool kids…. Donuts are like crack for the older generation. Damn the diabetes and full speed ahead Captain!! Night ~ you got it! Love reading your blog and love donuts too! Oh Serina Thank YOU! And really, loving donuts is ALL good 🙂 CHeers! You sure know a bargain when you hear one !!! I’m with you on that ??? Sasha..you have to get the hot cinnamon rolls there, just happened to go through the drive through when they were on the line. OMG take milk and wear glitter. Jessica….HOT CINNAMON ROLLS! OMG! I have never seen those, course I’m afraid to go inside because I might get sucked in by a giant vat of glaze, but I’ll have to check THAT out!! And yes…ALWAYS MILK! I never carry cash but I would have bought fresh hot donuts for 1.98……..using my card. Does it get any better than Krispy Kreme donuts fresh from the oven? Oh no it doesn’t….they are AMAZING!!! I have been pulled into the very same situation more than once! LOL We just have to learn to ignore that HOT sign! Joan ~ Ignoring the HOT sign isn’t even in my possibilities…ha! You are too funny, I really enjoy reading your blog! Hope you have a wonderful day. Julie ~ Thank YOU for reading my blog and have a simply FABULOUS day, too! I wish I was like you because I use my debt card for happy hour $1.08 and it drives my husband nuts. I never have cash on me. I also want tell you I love love you blog. Shellie ~ ha! I never never have cash…..and I HAVE used it for $2 and $3 before but I hate to. And I don’t even know WHY! Why should it even matter – ha! And Thank YOU for the love ~ so glad you enjoy reading it….I was looking back at some of the older ones this morning when I wrote this one and laughed again….does that make me bad? Hell, I wrote it, I should be used to it by now – 🙂 Cheers! Jan ~ mmmmm ~ donuts are so good! CJ ~ Oh, I COULD eat at least 6 but have to stop at 2 🙂 But JUST for you, I’ll eat another ~ ha! You bring smiles and laughter to my day! Krispy Crème were my husband’s favorites down in Tampa, but I was from the Philly area so he came up here to live. BUT….they have opened several Krispy Crème stores in the tri-state area. So he is happy, happy, happy! Donna ~ anywhere there is a Krispy Kreme is a HAPPY HAPPY time!! Love me some fresh,hot,krispy kreme doughnuts 😍😍…I sure miss them..as I am now up north…But I do get my fair share when I go back home to my heart NORTH CAROLINA ❤..Have a super day Sasha!! !You Rock!!! OH HOW I WISH I HAD A KRISPY KREME DONUT NEAR ME!!! SO JEALOUS!!!!!!!!!!!!!!!! Sally ~ I wish you did, too! They are so fabulous!!! !